Discussion in 'High Definition' started by thing, Jul 16, 2014. Is Mountaintop Motel Massacre region B locked? Yes. Sadly, Mountaintop Motel is region B. And it's not the fake type. Truly locked. And it looks like Blood Harvest will be as well. That's the title that's finally pushing me to buy a region free blu player. Turns out, they're cheap! I can't find confirmation for this title, but most of their releases that show a specific region are locked. DVDBeaver confirms The Long Hair of Death is B-locked. ... it looks like Blood Harvest will be (locked) as well. That's the title that's finally pushing me to buy a region free blu player. Turns out, they're cheap! If they're locking Blood Harvest that means someone in the US has licensed the title. I asked Code Red on Blu-ray.com whether they planned on releasing it and never got a reply. It's funny how he only shows up on that thread to complain but never addresses questions that could get people to support him instead of a foreign label. It's his loss - I've already placed my pre-order at 88 Films. Actually, this was produced and directed by our good friend and licensor, Bill Rebane and we've been in talks with him for quite some time about releasing this little-lost gem on Blu-ray. There are still some legal issues to unravel but there is a reasonable chance that we can make a deal to release it in 2018. There are tons of cool extras that would be included also. Keep your fingers crossed and if you're the type, say a little prayer for us!!! I did figure being locked meant it would come here in the states eventually. But then I realize, I also thought that when I ordered the 88 blu of mountaintop motel massacre in hopes of being able to bypass the code lock via remote control. It didn't unlock, but I can wait a few more years for that one. Blood Harvest is big time. I can't wait for that one. Thanks for the info!! Vinegar Syndrome, please strike a deal with VCI?? Pleeeease?? 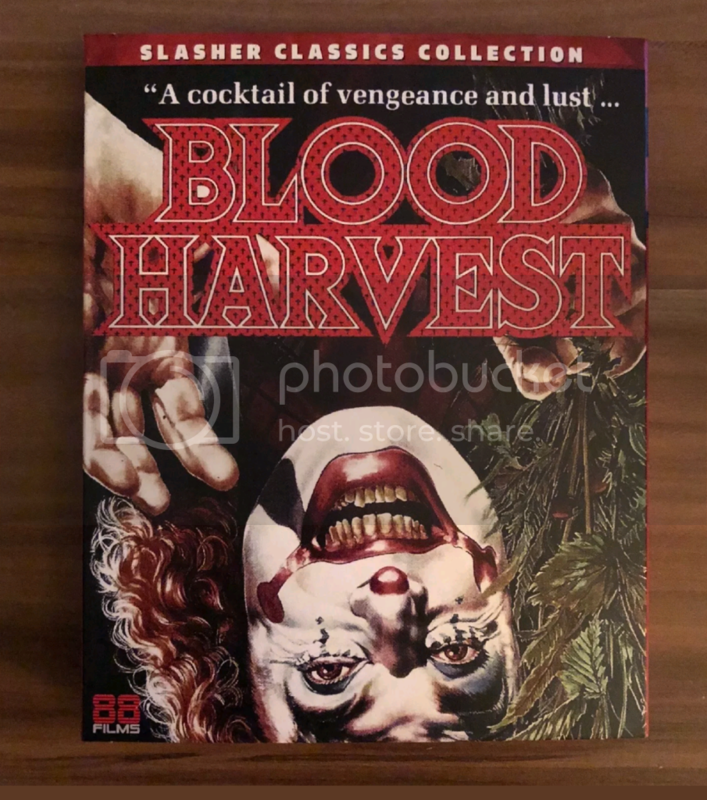 So, does anyone know what's going on with 88's blu-ray of Blood Harvest? It's listing vanished from Amazon, as well as 88's website. It did get released a bit early for a few copies. And I heard it was indeed region free, not "B" locked as originally announced. I was able to find a like-new copy for sale in the UK, ordered, eagerly awaiting!! But I've got to say, something weird is happening with this title. Maybe delayed for a region B re-pressing? It's still up for pre-order on zavvi.com, blu-ray and DVD. I wouldn't trust preordering from anywhere. Seek a UK seller that has physical copies in-hand! Not to ring fools alarms. I mean, it could very well emerge as expected. Region free and all. But it would be awesome if this one became a forced halt, valuable gem! No expectations. But very thankful I saved $ by not having to buy a region free blu-ray player afterall. I get to stay stubborn to the locked imports! I don't, would probably be very costly to 88 film, could hinder there future releases or worse force them under, hopefully just a delay. You're right. Though, I doubt they've got it all financially teetering on this one title. Though, obviously much costlier than say a printed postage stamp error. Legal education is expensive. They.might be learning? A very abrupt lockup on distribution it seems. Don't barge and jump the gun on things. Obviously, the USA company (sounds like VCI) is playing it kosher & straight. Where has it been reported as region free? I would love to pick this one up but I'm a neanderthal without a region free player. Well, right here. By me. And I haven't even received the disc yet. I could be very wrong via misinformation. My info came from the Englishman that I purchased it from. He's into blu ray, knows about region locks. He obviously turned out to not be a fan of Blood Harvest (I can't imagine). I'll report after it arrives. How long does global priority mail usually take? That review seals it. Region All. And is making me as excited as I've ever been for a home video package! 88 films or not, this was an undeserved punch to the USA company. I'll still buy several copies of the eventual domestic release. Good news: Blood Harvest is back up on the 88 Films website. Bad news: ...who knows for how long. For reasons we can’t discuss on Facebook, Blood Harvest won’t be released in March as we hoped and will be TBC for the time being EXCEPT from our website where you can order it now with a slipcase (we’ve added one to all units now). Is this movie good? I’m really tempted to grab it. It's great that obscure titles like these are being released for fans, but it's definitely no 'lost' classic, there's not much story, gore, and the performances are bottom of the barrel, if you are a slasher completest, then it's a must have, otherwise, probably best too see before you buy.